1. Not to make a mistake, measure all the ingredients in advance with a measuring cup and measuring spoon. If you make a mistake, you will waste 4 hours baking the bread. (Measuring cup and measuring spoon come with the bread machine.) Or, you want to remember where you are up to if anyone talked to you while placing the ingredients. 2. 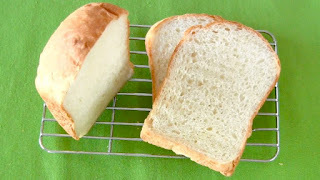 Remove the bread pan (twist the bread pan anti-clockwise and lift up to remove) and set the kneading blade. Make sure that they are clean before you use. 3. Place and pile up the bread flour, sugar, powdered milk, salt, and butter in the middle of the bread pan. Then pour in the water around the pile. Wipe the outside of the pan to remove any flour or liquid. 4. Put the bread pan into the bread machine and turn slightly clockwise. 6. Open the upper lid and place the dry yeast in the dry yeast dispenser. It will add the dry yeast automatically. Wipe if it's wet but avoid generating the static electricity. 7. Choose a baking option. Select a bread type. Start the machine. 8. When it's done, press stop and remove the bread pan from the bread machine immediately. Leave to cool on a kitchen cloth for 2 minutes. Then remove the bread from the bread pan and allow to cool on a wire rack. Remove the blade if the blade got stuck in the bread. I know you can't wait for 4 hours, so set the timer so that it would be ready in the morning!